So I'm new to pure sourdough breads. I've been baking breads with commercial yeast for years but recently was given Flour Water Salt Yeast and wanted to try one of the pure levain breads. 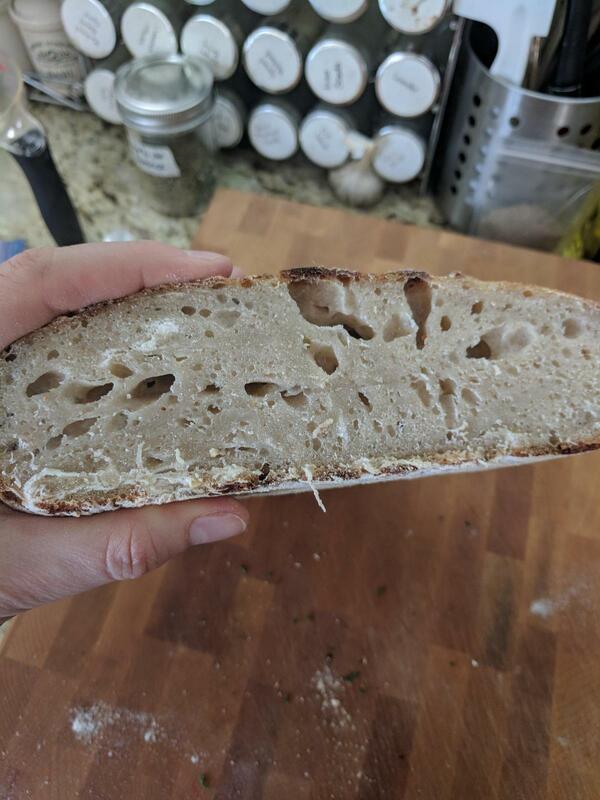 I spent two weeks making and feeding a sourdough mother, and then took a stab at the Country Blonde dough from the book. I was prepared for the dough to be very sticky so that wasn't a problem. But it really didn't rise much during the bulk fermentation that he calls for and then it didn't rise at all during baking! - I'm on well water and we use a water softener, which I've heard can affect things. - maybe I should shorten my times for bulk fermentation? - not enough prayer and ritual sacrafice to bread gods? Any advice would be very welcome, I'm quite new to a lot of the fancy terminology so please give me simple terms, I would be thankful! I'm inclined to agree with you. It's all in the starter. Forkish is over generous when it comes to fermentation and if your starter is under performing then the problem lies with the starter. Don't lose hope. We all have mishaps when we give up commercial yeast. First piece of advice: Don't assume someone else's quantities and temperatures will work the same for you. Sourdough is dependent on the conditions in your environment. When I first began using sourdough exclusively (15 years ago) I free-formed my loaves. Now I prefer baking in cast iron loaf pans because it's easier to slice. Consistency helps when you first begin. A scale with tare in grams rather than ounces helps. I always weigh my flour in grams. I also weigh the water in grams. I always use the "discard" from feeding my starter to make my bread. After I mix the bread dough I let it sit on the counter for a while before forming loaves or let it sit in the refrigerator over night before forming loaves. I like to knead the bread dough but that is me. The longer you let it sit, you really don't need to knead LOL, but I like feeling the dough come to life. You have to find the best routine for your lifestyle. Depending the on the ambient temperature in the kitchen, once the loaves are formed and set to rise, it may take up to 8 hours before it is risen enough to bake; but sometimes it's only 4 hours. I have to keep an eye on it. 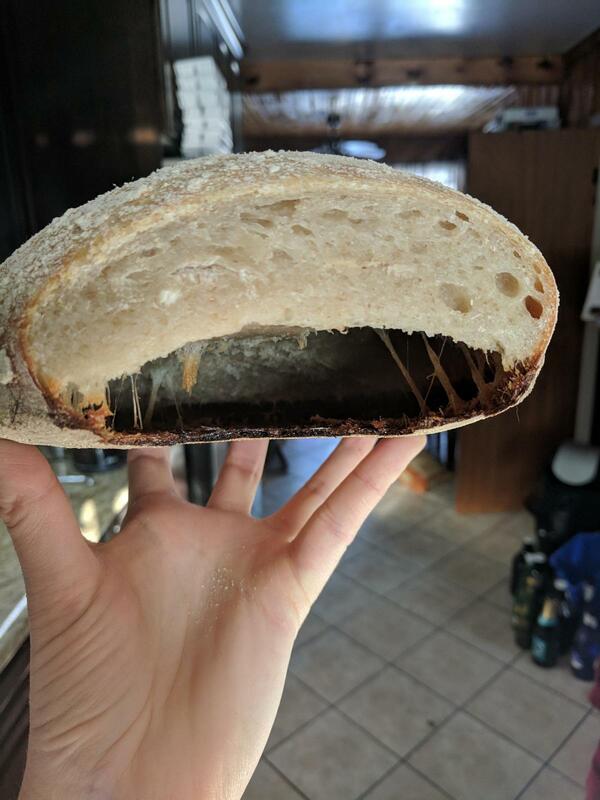 Sourdough is a living thing and it is sometimes cooperative, other times complacent, and still other times very ornery, but it is so worth it. My starter is used for whole wheat bread, white bread, pancakes, waffles, flat bread, pizza, and onion rolls. Water softeners do cause some odd problems with various things, depending on which way they work. I have no idea of their effect on sourdough. If it is causing a problem, what options do you have? Is your water usable in its untreated state? Patience is the key to bread making and patience squared is the key to sourdough! Let the dough rise until it has doubled! Don't watch the clock; watch the dough. Test it for doubling with the two finger test. If the indentation springs back it has NOT risen enough. Don't shorten the bulk fermentation. My room temperature is about 77°F and the bulk fermentation takes about 2 1/2 hours. The final fermentation takes just a little less. in that 2nd photo! I've never seen anything quite like that. That 1st photo is common when people start out. Either your starter is still too slow, or you aren't fermenting the dough long enough. You can fix it either way. Preferably work on your starter first, it should peak within 6 hours at more than double (given a normal size feeding like 1 part starter, 2 parts water, 2 parts flour). If it's not peaking soon enough, you should feed it every time it peaks for at least 5 feedings and see if that helps it speed up. If it refuses to get any faster, then you might be stuck with a slow starter... which is still workable. My guess is that it will speed up since it is only 2 weeks old. Keep feeding it every time it peaks until it doesn't get any faster. If you need more time away from the starter, give it a giant feeding (1:15:15 or so) and it will take longer to peak, but don't refrigerate it until it's gotten fast. Once the starter is known to be good, then you need to just wait for your dough to rise. That might take a long time. It might even take 8 hours or more. Depends on the speed of the starter, the percent starter used in the recipe, the temperature, and other stuff so you can't easily predict it when you are starting out, you just have to watch the dough. You will get this. Just keep at it. And good luck. It has taken me several months to finally make a sourdough starter, and I made my first loaf last night, but it has taken a full 24hrs and I still haven't seen more than a 25% rise from the time I kneaded it until now, I'm not sure what I'm doing wrong either, or if it's my starter.